Peace River is the cultural and economic hub of the north Peace Region. The town of 6700 people is nestled in the Peace River valley. 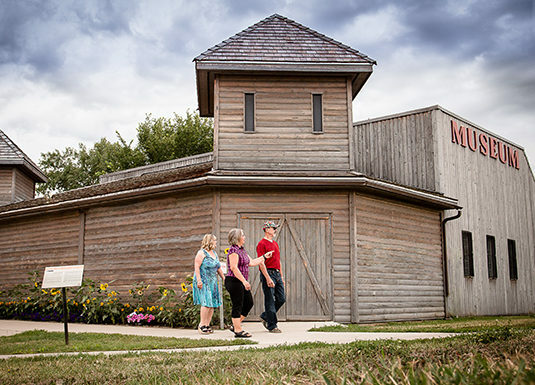 The Peace River Museum, Archives and Mackenzie Centre is the local museum featuring Peace River history. The Museum focuses specifically on the Town’s history, but the Archives has a regional collection mandate for the north Peace Region. Established in 1967, it is home to more then 8,500 artefacts and more than 13,000 archival items. The Peace River Museum, Archives and Mackenzie Centre is seeking an Archival Assistant for the fall of 2017. The Archives Assistant is accountable to the Archivist, Heritage Coordinator and Records Manager of the Peace River Museum, Archives and Mackenzie Centre and the Records Manager of the Town of Peace River. The function of this position is to assist with processing the backlog of archival material in the archives and the back log of historical material at the town ready to be transferred to the archives. The Archives Assistant is a full time – temporary position wit the Peace River Museum, Archive and Mackenzie Centre, a Town of Peace River owned and operated facility. Should be a recent graduate with a Master of Library and Information Science or Archives and Records Management Certificate (or equivalent). A focus in archives would be preferable. Candidates with degrees in History and Public History may also be considered, especially if they have archival experience. Research experience with primary and secondary resources is required. Candidate should have an eye for detail, be well organized, and have good written and communication skills. They should be comfortable with performing repetitive and detailed tasks that may be considered tedious. Knowledge and use of a flatbed scanner and experience handling antique photographs and negatives is preferred. One year minimum experience of working in an archive working with the collection and handling research requests is also valued. Candidates should be self-motivated and able to work independently with little supervision. Candidates should also be able to work independently as well as part of a team. Experience working in a municipal setting and records management are also valued. Although not essential, it would be helpful for the candidate to have the ability to read basic French, as there is a small percentage of records at the Archives and Town Hall that are written in French. We invite serious applicants to apply with their resume and covering letter to the contact below. Please quote Competition # 17/029. We thank all applicants in advance for their interest, however, only those applicants who will be interviewed will be contacted.